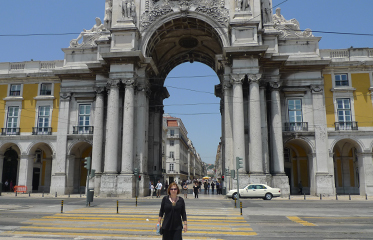 It is locally known as Terreiro do Paço (palace square). This was a site of the Royal palace built in 1500 and destroyed in the eartquake of 1755. Square was completely rebuilt in symetrical design with two towers and the monumental entrance to the downtown area of Lisbon (Baixa). It is now without palace in the middle and named Praça do Comércio to signify its new function. Dominationg the centre of the square is the equestrian statue of King José I, inaugurated in 1775. Our new visit to Praça do Comercio was in March 2017.